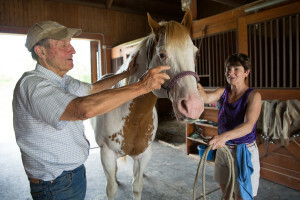 Rhinebeck Equine LLP provides comprehensive care to our patients in the field, whether the need is urgent or routine. We take pride in the high level of care and expertise that our veterinarians provide at their patients’ home location. Timely, progressive, high quality medical and surgical care in the field has been the foundation of our practice from its inception. Our ambulatory veterinarians are equipped with portable digital X-ray equipment and ultrasound units on their specially designed vehicles. Videoendoscopy equipment, Powerfloat® units, and an HMT® Extracorporeal focused shockwave unit are all available for use by the ambulatory doctors. Discussion of cases by our veterinarians, including frequent consultations with our specialists,ensures that each of our patients is receiving the benefit of the experience of our talented team. This dynamic exchange allows us to provide exceptional care for your horse.